Citizens Advice Bureau (CAB) is hosting an open evening on Monday. There are many times in people’s lives when they need support, advice and information on a myriad of concerns that cross their path. 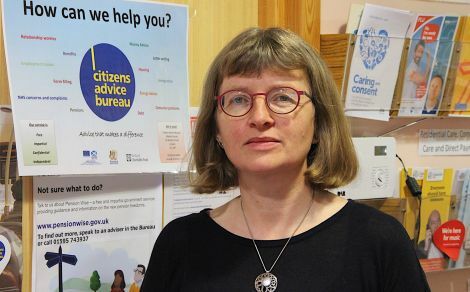 Based at Market House, Lerwick, the Citizens Advice Bureau (CAB) is a charitable organisation that offers free advice on a wide range of topics ranging from questions about benefits, debt, consumer issues, domestic, relationship and legal issues. Bureau manager Karen Eunson spoke to Alex Purbrick about the range of services available through CAB and how important the bureau is for vulnerable people, and those who are in desperate need of help and advice. “We advised clients on 7,200 issues in 2017/2018 and over half of those were concerning benefit advice. A lot of what we do is looking to see if people are getting the right kind of benefit or support that they need. The Department of Work and Pensions (DWP) estimates there to be £13 billion of annual unclaimed benefits in the UK so obviously CAB are aiming to resolve this by helping people to see if they are receiving all entitled benefits and help with completing benefit applications. As well as benefit and debt advice, CAB gives advice on energy issues. Karen explained that if “someone doesn’t have the funds to heat their house sufficiently, our aim is to increase their income, reduce their outgoings and help them improve the energy efficiency of their home so they can then achieve affordable warmth”. CAB has certainly been successful in advising and supporting people with benefit claims, debt eradication and energy assistance as almost £1.7 million was brought into Shetland this last year in financial support from government funding benefitting local people and the local economy. Although CAB is based in Lerwick there are many people who cannot always access the service in town which is why there are monthly outreach sessions available in health centres across the isles. Karen described how “there’s a lot of evidence nationally that people going to their doctor have a problem in part non-medical, or stress related due to debt etc. Health centres are a central hub in the community and are relatively accessible. Health practitioners can refer patients to CAB who need advice on debt etc, which then frees up time and relieves the pressures faced by medical staff”. There are such a wide range of support services provided by CAB that it would be impossible to coordinate without the help of a body of volunteers who run the general support, with the paid staff providing specialised assistance. Karen said that there were “no set qualifications to be a volunteer. People need to be confident writing, using numbers, basic computer skills, but people do not have to have specialised qualifications”. “They do need to be available six to eight hours a week,” she continued. “There is a training process online. We also run face-to-face courses. They learn the theory side of everything, the practice is an apprenticeship where they’ll come in and be matched with an experienced advisor. There are many rewarding aspects to being a volunteer according to retired councillor Allan Wishart, who has been a volunteer at CAB since May 2017. “When you’ve been busy all your life this gives you a purpose and gives a routine in life for someone like me who is retired and has no routine. Helen Wilson is another volunteer who has worked at CAB for 12 years. She was delighted CAB offered her the chance to be a volunteer, which boosted her confidence hugely. CAB is hosting an open evening in their Market House offices on Monday 3 December at 7pm, and would welcome anyone interested in becoming a volunteer for the organisation.